MS Dhoni had gone from ticket collector to World Cup hero but the nation could not fathom why he also went bald. An entire nation of over a billion people was still leaping with elation beyond compare but the eyes must have been heavy from lack of sleep and abundance of overzealous celebration – it was just hours ago that India had become the first host nation to lift the ICC World Cup and the streets were still full of people draped in the tricolour. The captain of the nation's cricket team had disappeared in his room of the Taj Mahal Hotel and was unavailable for any interviews or thoughts. The last the nation remembered of him was the iconic moment when he launched Nuwan Kulasekara over long on for the winning six. Dhoni had held his pose for a couple of extra seconds, gazing into the night sky almost in disbelief – the boy from Ranchi who was only a ticket collector last time India was in a World Cup final had not only led India to the promised land but also scripted its final chapter as only he could. 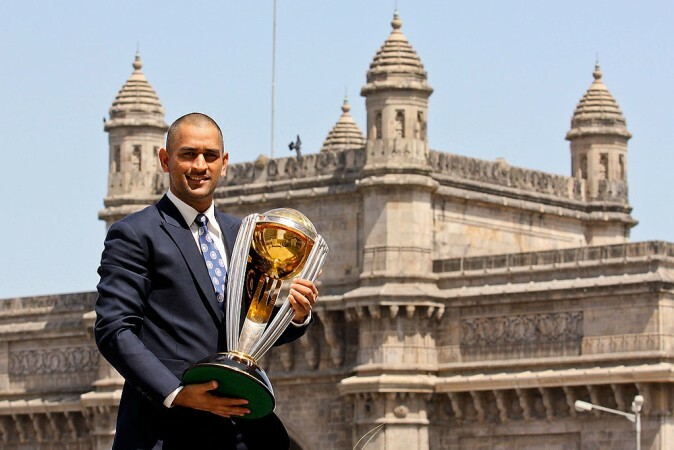 The next the nation saw of him was a Dhoni whose head was completely shaved and with World Cup trophy in hand, he was posing in front of the Gateway of India. For far too long June 25 was India's day of triumph and after 28 long years, as India rejoiced, an entire generation would now grow up with April 2 as their happiest childhood memory. But for the man who won it in 1983, it was too much to take as Kapil Dev broke down on national television lauding the efforts of India's third great leader, Sourav Ganguly. Indeed the 2011 team had a big imprint of the Ganguly era – Yuvraj Singh, Virender Sehwag, Zaheer Khan, Harbhajan Singh, Ashish Nehra and as Dhoni's biopic suggested, MSD himself. The debate between Ganguly and Dhoni has always been hotly contested in these parts of the world but on this day, 8 years ago there could be no divide. For a country having a penchant for division on extremely trivial grounds, April 3 was a landmark occasion. It did not matter what colour you were; it did not matter what meat you ate or whether you ate meat all; it did not matter how big your house was or if the pavements were your shelter; it did not matter which faith you followed or whether you were an atheist – the embraces lasted a little longer and the tears refused to dry up. You were irreproachably Indian and only sport can unite beyond every divide with such unflinching assurance. "Dhoni is the greatest captain of our country," Ganguly would later go on to tell Mid-Day. "His record is proof of that. Under Dhoni, India have won the Twenty20 World Cup and the Asia Cup. Under him, India have become the No. 1 ranked side in Test cricket. And now, we have won the World Cup. Obviously, he is the greatest ever captain to lead India." But why did India's greatest captain go bald? Dhoni would later tell a journalist that his head felt heavy and he shaved it himself in his room to feel light. Everyone the team met in the two World Cup months had only one thing to say, "World Cup aa raha hai na?" or as the English were singing at the 2018 FIFA World Cup, "Is it coming home?" Captain cool was only human and he needed a respite from the Everest of expectations. Thus, from flowing mane to a bald head, MS Dhoni had aged a thousand but after the hurly-burly was done, the battle was convincingly won and won.